Yugi thought that his classmate Bakura Ryou was a sweet and good-natured kid. Yugi was right about that, until the evil of the Millenium Ring took over Bakura Ryou’s mind and transformed him into the nefarios Yami Bakura. Unfortunately for Yugi and his friends, Bakura kept the sinister Millenium Ring close at all times. Bakura is a new transfer student into Yugi Mutou’s high school class. 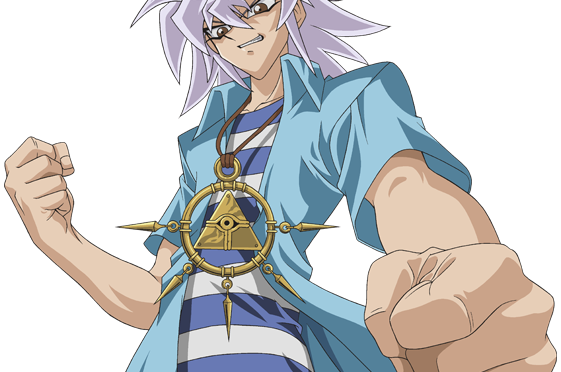 The normal Bakura is a kind-hearted person who encourages Yugi and Jounouchi through their duels in Duelist Kingdom. 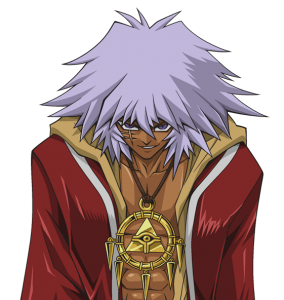 The bad part to Bakura is that he is the wielder of another Millennium item. He wields the Millennium Ring, contrary to Yugi’s Millenium Puzzle, Pegasus’ Millennium Eye, and Malik’s Millennium Rod. Bakura’s Millenium Ring contains a very evil spirit that takes control of him and has very dark ambitions that rival even Yami Malik’s ambitions. The Millennium Ring has the power to locate other millennium items with its various pointers. Yami Bakura is first seen when Yugi is challenged to a Game of Darkness (English: Shadow Game) by Bakura in the Duelist Kingdom. Bakura entraps normal Yugi, Honda (English: Tristan), Jounouchi (English: Joey), and Anzu’s (English: Tea) souls into their favorite cards inserted in Yugi’s deck. Yami Bakura then proceeded to claim the Millennium Puzzle in which Yami Yugi stopped him. Yami Yugi won his duel versus Yami Bakura with a quick use of his shadow powers. He switched normal Bakura’s soul with the soul of Yami Bakura in Bakura’s Change of Heart card to send Yami Bakura to the graveyard. At the very end of Duelist Kingdom, Yami Bakura makes a return appearance by “disposing” of Pegasus and taking his Millennium Eye. When Battle City rolls around, Bakura is still with the group, but Yami Bakura shows his true intentions of taking the Millennium Puzzle. He duels Yami Yugi again in a rematch, during Battle City. Yami Bakura took an early advantage using a combo from his Occult Deck, involving the Dark Necrophia (English name: Unknown) and Quija Board. Yami has not reappeared in the series, manga or anime, since that duel. He uses an Occult deck, which is a mixture of dark main type monsters, and fiend monsters. He is pretty good at dueling with this in his Yami form. His main combo is the Dark Necrophia / Ouija Board combo, but if not he has some strong back-up monsters lying in wait. Yami’s hatred for the Pharaoh stemmed back to ancient Egypt, when he was the King of the Bandits. Born and raised in Kul Elna Village, the Bandit King saw his family and friends sacrificed for the creation of the Millennium Items. He wanted revenge against the royal court.